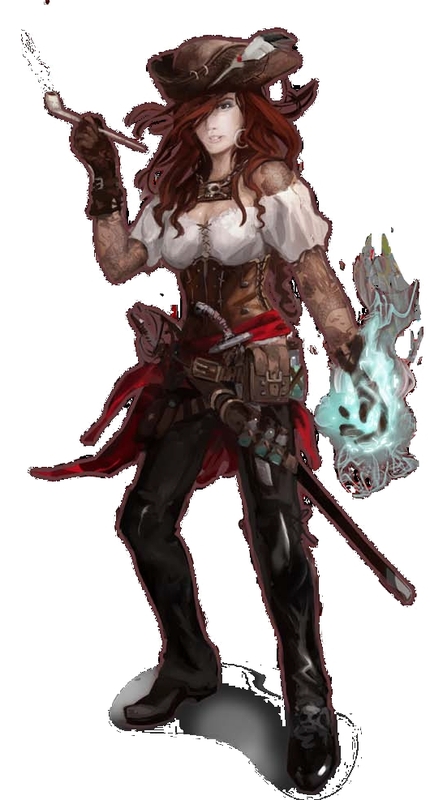 Sandara Quinn is a cleric of Besmara the Pirate Queen, goddess of piracy, sea monsters, and strife. Impressed on the Wormwood like the PCs, Sandara takes an immediate liking to them, the result of a recent altercation with Master Scourge. She is a potential ally for the PCs from the very start—the only one aboard the Wormwood initially. Before the start of the adventure, while the PCs were sleeping, Sandara visited Cut-Throat Grok and convinced the quartermaster to return her personal equipment, claiming the items were righteous artifacts blessed by Besmara that would bring a terrible curse on those who wrongfully held them. She also managed to acquire two items of use to the PCs. These items should be ones that two PCs would struggle to cope without, such as spellbooks or formula books, holy symbols, thieves’ tools, or, if no PCs have such requirements, two light weapons. If the PCs don’t already know her, Sandara approaches them as soon as she can on their first day on the Wormwood to return their equipment and offer her friendship. She explains that on a pirate ship, it’s not what you know but who you know that helps you get by. Friends help each other out, enemies cause trouble—on a crowded pirate ship, this fact is essential for basic survival. Sandara is detailed fully in the NPC appendix on page 56.
daughter, and Sandara grew up on the port’s hard streets, where she quickly learned to look after herself. She worked on the docks when she could, carrying out what jobs she could get, and soon developed a keen eye for trouble and a reputation for standing up for herself. She began frequenting the bars and taverns of Hell Harbor by the age of 9 and was learning the ropes of sailing by the age of 12. Sandara’s calling came one night when a f leet of fishermen, which included her father, was lost in a powerful storm. Sandara prayed to Besmara the Pirate Queen, the goddess of piracy, strife, and sea monsters, and when her father returned the following day, weatherbeaten and half-drowned but still alive, Sandara knew the goddess had answered her prayers. Soon after, Sandara began devoting her time to the worship of Besmara, eventually setting up a small chapel on the Hell Harbor docks dedicated to her. like a fish returned to the sea from which it was born. goddess while expanding her horizons at the same time. should they accept her friendship. and believes the PCs might make for helpful allies. single check made by a struggling PC, as appropriate. become a romantic interest for a PC, if you wish. any sinister motives, however, and is just as she seems. make her an important NPC ally. she moves on without them.